At the end of the 19th century, a Russian prince built on this historical site between Nice and Monaco. 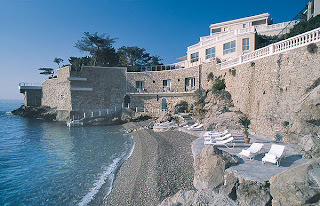 In the 1950’s the Cap Estel was developed into a deluxe hotel, welcoming luxury travelers for all over the world. After a three year renovation program Cap Estel has again found its former splendor with state of the art technology. In the guest rooms at Cap Estel, contemporary furnishings with pure lines opt for noble materials, delicate nuances or glamorous tones. Their balconies or terraces offer unique views of the Mediterranean. Cap Estel also offers suites, each with a different design and style. In order to preserve the privacy of the site and its personalized service, the establishment proposes restaurant service at the Pool House or in the dining-room.